I’ve heard these called both Mexican Wedding Cookies and Russian Wedding Cookies: take your pick. Either way, they’re easy, almondy cookies that look pretty on a Christmas buffet and travel well. Vegan version: This is one of the few traditional cookie recipes that doesn’t require eggs, so you can sub non-whey (check the ingredients) margarine for butter for a vegan variation. Chocolate version: Reduce flour to 1 3/4 cups. Add 1/4 cup of cocoa powder. Instead of 1/2 cup powdered sugar, combine 6 tablespoons of powdered sugar with 2 tablespoons of cocoa powder and roll cookies as directed. In a medium bowl, cream the butter and sugar. Stir in vanilla and water. Add the flour and almonds, mix until blended. Cover and chill for an hour or two. Preheat oven to 325 degrees. 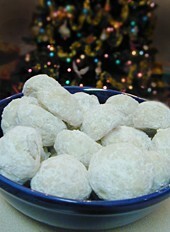 Shape dough into balls. Place on an unprepared cookie sheet and bake for 15 to 20 minutes in the preheated oven. Meanwhile, spread powdered sugar along the bottom of a shallow dish. Roll hot cookies in sugar. The sugar will get a bit melty and sticky. Allow to cool, then roll in sugar again. Store at room temperature in an airtight container. This entry was posted on Wednesday, September 12th, 2007 at 2:11 pm	and is filed under Desserts, Holiday & Seasonal, Master Recipe Index, Vegan or Vegan-able, Vegetarian. You can follow any responses to this entry through the RSS 2.0 feed. You can leave a response, or trackback from your own site.